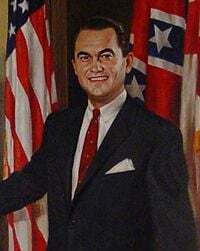 George Corley Wallace, Jr. (August 25, 1919 – September 13, 1998), was United States politician who was elected Governor of Alabama as a Democrat four times (1962, 1970, 1974 and 1982) and ran for US President four times, running as a Democrat in 1964, 1972, and 1976, and as the American Independent Party candidate in 1968. He is best known for his pro-segregation attitudes during the American desegregation period, which he modified after the passage of the Civil Rights Act of 1964, arguing that it was better for him to be Governor while the schools were being desegregated than for someone else. Wallace was so adamant in his belief in segregation that he opposed a Federal mandate in 1963 to allow African-Americans to attend school with white Americans. Wallace was born on August 25, 1919, in Clio, Alabama to George Corley Wallace Sr. and Mozell Smith, he became a regionally successful boxer in his high school days, then went directly to law school at the University of Alabama in 1937. After receiving a law degree in 1942, he enlisted in the US Army Air Corps, flying combat missions over Japan during World War II. Wallace attained the rank of staff sergeant in the 58th Bomb Wing of the 20th Air Force Division. He served under General Curtis LeMay. LeMay later became his running mate in the 1968 presidential race. While in the service, Wallace nearly died from spinal meningitis, but prompt medical attention saved him. He was left with partial hearing loss and nerve damage, and was medically discharged with a disability pension. Wallace's first foray into politics was in 1938, at age 19, when he contributed to his grandfather's successful campaign for probate judge. Late in 1945, he was appointed Assistant Attorney General of Alabama, and during May 1946, he won his first election as a member to the Alabama House of Representatives. At the time, he was considered a moderate on racial issues. As a delegate to the 1948 Democratic National Convention, he did not join the Southern walkout at the convention, despite his opposition to President Harry Truman's proposed civil rights program, which he considered an infringement on states' rights. The dissenting Democrats, known as Dixiecrats, supported then-Governor Strom Thurmond of South Carolina for the presidency. In his 1963 inauguration as governor, Wallace excused this action on political grounds. From left to right: Governor Wallace, NASA Administrator James E. Webb and scientist Wernher von Braun at the Marshall Space Flight Center. In 1958, he was defeated by John Patterson in Alabama's Democratic gubernatorial primary election, which at the time was the decisive election, the general election still almost always being a mere formality in Alabama. This was a political crossroads for Wallace. Patterson had run with the support of the Ku Klux Klan, an organization Wallace had spoken against, while Wallace had been endorsed by the NAACP. The lines were written by Wallace's new speech writer, Asa Carter, a Klansman and longtime anti-Semite. Wallace later stated that he had not read this part of the speech prior to delivering it, and immediately felt remorse. On June 11, 1963 he stood in front of Foster Auditorium at the University of Alabama in an attempt to stop desegregation of that institution by the enrollment of two black students, Vivian Malone and James Hood. This became known as the "Stand in the Schoolhouse Door." Wallace stood aside only after being confronted by federal marshals, Deputy Attorney General Nicholas Katzenbach, and the Alabama National Guard. However, there is evidence that the entire encounter was partially or wholly coordinated with the Kennedy administration to allow Wallace to save face with Alabama voters. The principal achievement of Governor Wallace's first term was an innovation in Alabama development that several other states later adopted: he was the first Southern governor to travel to corporate headquarters in Northern and Northeastern states to offer tax abatements and other incentives to companies willing to locate plants in Alabama. Numerous companies did so, notably shoe and textile manufacturers from the Northeast, and others such as Uniroyal, which located its first modern tire plant in Opelika, Alabama. Wallace also initiated a junior college system that is now spread throughout the state, preparing many students to complete four-year degrees at Auburn University or the University of Alabama. Using the infamous public image created by the University of Alabama controversy, he mounted his first attempt at the United States presidential election, 1964, showing surprising strength as a national candidate in Democratic primaries in Wisconsin, Maryland and Indiana, winning as much as a third of the vote. His "outsider" image, opposition to civil rights for blacks, message of states' rights, and "law and order" platform during the turbulent 1960s appeared to have national appeal. Wallace ran again as a third-party candidate in the United States presidential election, 1968 as the American Party candidate, and as a Democrat in 1972 and 1976. Alabama's state constitution prevented him from seeking a second term in 1966, a restriction that was eventually repealed, largely due to the work of his backers. However, the repeal of the term limit was not in time for Wallace himself to run that year. Wallace circumvented this by having his wife, Lurleen Wallace, run for the office as a surrogate candidate, similar to the 1917 run of Ma Ferguson for the governorship of Texas on behalf of her husband, who had been impeached and was barred from running himself. Mrs. Wallace won the election in the fall of 1966, and was inaugurated in January, 1967. Lurleen Wallace died in office on May 7, 1968, during her husband's presidential campaign. She was succeeded by Lieutenant Governor Albert Brewer, reducing Wallace's influence until his new bid for election in his own right in 1970. When Wallace ran for President in 1968, it was not as a Democrat but as a candidate of the Independent American Party. He hoped to receive enough electoral votes to force the House of Representatives to decide the election, presumably giving him the role of a power broker. Wallace hoped that Southern states could use their clout to end federal efforts at desegregation. This did not occur. Wallace ran a "law and order" campaign similar to that of Republican candidate, former Vice President Richard Nixon. This worried Nixon that Wallace might steal enough votes to give the election to the Democratic candidate, Vice President Hubert Humphrey. Wallace's presence in the race negated the Southern Strategy, split the conservative vote and brought Humphrey within a few hundred thousand votes of winning. Wallace's rhetoric could often be violent, such as pledging to run over any demonstrators who got in front of his limousine. He accused Humphrey and Nixon of wanting to radically desegregate the South, and promised to stop black progress. Wallace said, "There's not a dime's worth of difference between the Democrat and Republican Parties." His campaign in California and other states was a haven for some on the far right, including the John Birch Society. Most of the media opposed Wallace, but some southern newspapers enthusiastically backed him. George W. Shannon (1914–1998) of the now defunct Shreveport Journal, for instance, wrote countless editorials supporting the third-party concept in presidential elections. Wallace repaid Shannon by appearing at Shannon's retirement dinner. Wallace's "outsider" status was once again popular with voters, particularly in the rural South. He won almost 10 million popular votes, carried five Southern states, came fairly close to receiving enough votes to throw the election to the House of Representatives, and became the last person (as of 2007) who was not the nominee of one of the two major parties to win electoral votes. He was the first such person since Harry F. Byrd, an independent segregationist candidate in the 1960 presidential election. (John Hospers in 1972, Ronald Reagan in 1976, Lloyd Bentsen in 1988 and John Edwards in 2004 all received one electoral vote from dissenters, but none "won" these votes.) Wallace also received the vote of one North Carolina elector who was pledged to Nixon. Wallace said he disagreed with Abraham Lincoln that blacks should be able to vote, serve on juries, or hold public office — although he agreed with Lincoln that equality for blacks could come with education, uplift, and time. His platform also contained a few progressive planks, such as generous increases for beneficiaries of Social Security and Medicare. In his speeches and in the public mind, Wallace promoted a pro-White patriotic populist view of America. In 1970 he was elected governor of Alabama for a second term. He faced incumbent governor Albert Brewer, who became the first gubernatorial candidate since Reconstruction to openly court black voters. Brewer, hoping to build a broad alliance between blacks and white working class voters, unveiled a progressive platform and accused Wallace of spending too much time outside the state, saying "Alabama needs a full-time governor." In an effort to weaken the prospects of another presidential campaign in 1972, President Nixon backed Brewer in the Democratic primary, and arranged an Internal Revenue Service investigation of possible illegalities in the Wallace campaign. Brewer got the most votes in the primary but failed to win an outright majority, triggering a run-off election. Wallace, whose presidential ambitions would have been destroyed with a defeat, ran "one of the nastiest campaigns in state history," using racist rhetoric while proposing few ideas of his own. The Wallace campaign aired TV ads with slogans like "Do you want the black block electing your governor?" and circulated an ad showing a white girl surrounded by seven black boys, with the slogan "Wake Up Alabama! Blacks vow to take over Alabama." Wallace called Brewer a sissy  and promised not to run for president a third time. The campaign worked, and Wallace defeated Brewer in the runoff. The day after the election, he flew to Wisconsin to campaign for the White House. A Gallup Poll at the time showed Wallace to be the seventh most admired man in America, just ahead of Pope Paul VI. In early 1972, he once again declared himself a candidate for president, this time as a Democrat. When running in Florida against the liberal George McGovern, 1968 nominee Hubert Humphrey, and nine other Democratic opponents, Wallace won 42 percent of the vote, carrying every county in the state. While campaigning in Laurel, Maryland, on May 15, 1972, Wallace was shot five times by a would-be assassin named Arthur Bremer. Three others wounded in the shooting also survived. Bremer's diary, published after his arrest as An Assassin's Diary, showed that Bremer's assassination attempt was not motivated by politics, but by a desire for fame, and that President Nixon had been a possible target. The assassination attempt left Wallace paralyzed, as one of the bullets had lodged in his spinal column. Following the shooting, Wallace won primaries in Maryland, Michigan, Tennessee, and North Carolina. Wallace spoke at the Democratic National Convention from his wheelchair in Miami on July 11, 1972. The eventual Democratic nominee, Senator George McGovern of South Dakota would be defeated by President Nixon in a landslide, with Nixon carrying 49 of the 50 states, losing only in Massachusetts. While Wallace was recovering in a Maryland hospital, he was out of the state for more than 20 days, so the state constitution required the lieutenant governor, Jere Beasley, to serve as acting governor from June 5 until Wallace's return to Alabama on July 7. Bremer was sentenced to 53 years in prison for the shooting. In November 1975, Wallace announced his fourth and final bid for the presidency. The campaign was plagued by voters' concerns with his health, as well as the media's constant use of images of his apparent "helplessness." His supporters complained such coverage was motivated by bias against him, citing the discretion used by some of the same organizations in coverage, or lack of coverage, of Franklin D. Roosevelt's paralysis three decades earlier and before television became commercially available. After losing several Southern primaries to former Georgia governor Jimmy Carter, Wallace dropped out of the race in June 1976. He eventually endorsed Carter, while claiming that he facilitated a Southerner's presidential nomination. In the late 1970s Wallace became a born-again Christian, and in the same era apologized to black civil rights leaders for his earlier segregationist views, calling these views wrong. He said that while once he sought power and glory, he realized he needed to seek love and forgiveness. His final term as Governor (1983–1987) saw a record number of black Alabamians appointed to government positions. Wallace's main opponents in the 1982 Alabama gubernatorial Democratic primary were Lieutenant Governor George McMillan, Jr. and Alabama House Speaker Joe McCorquodale. McCorquodale was eliminated in the primary, and the vote went to a runoff between Wallace and McMillan, with Wallace holding a slight edge. Wallace won the Democratic nomination by a margin of 51 to 49 percent. His next opponent would be Montgomery mayor Emory Folmar, a Republican, in the general election. Most polling experts said this was the best chance for a Republican to be elected Alabama governor for the first time in the state's history. However, Wallace won the general election going away, 62 to 39 percent. The 39 percent was the highest vote total for a Republican gubernatorial candidate in Alabama's history. In his later days, Wallace became something of a fixture at a Montgomery restaurant a few blocks from the State Capitol which he had almost totally run in the past. Despite being in pain, he was surrounded by an entourage of old friends and visiting well-wishers. He continued this ritual until only a few weeks before his death, by which time he had grown too ill.
Wallace died of septic shock from a bacterial infection in Jackson Hospital in Montgomery on September 13, 1998. He had suffered from Parkinson's disease and respiratory problems in addition to complications due to his spinal injury. After his death, the tunnel in Mobile that carries Interstate 10 beneath the Mobile River was renamed the George Wallace Tunnel. Counting Lurleen Wallace's term as his surrogate, George Wallace had the remarkable achievement of winning five gubernatorial terms across three decades, totallng over 17 years in office. It would have been 20 if Lurleen had served four years instead of 17 months. This record is approached by the 15-year tenure of Governor Nelson A. Rockefeller in New York, the 14-year tenure (in consecutive terms) of Governor James R. Thompson of Illinois and Governor Tommy Thompson of Wisconsin, as well as the 16-year tenures attained by Governors Terry E. Branstad of Iowa (in consecutive terms), and Governors James A. Rhodes of Ohio, Edwin Washington Edwards of Louisiana, and James B. "Jim" Hunt of North Carolina (in non-consecutive terms). ↑ Steve Flowers Inside the Statehouse. Column of October 12, 2005, Retrieved September 17, 2007. ↑ Phillip Rawls Rawls, Phillip, "Book Rates George Wallace's '70 campaign as the nastiest," Decatur Daily. Retrieved September 17, 2007. Governor Wallace`s Schoolhouse Door speech ADAH Alabama Department of Archives and History. History of "George Corley Wallace"
This page was last modified on 13 June 2017, at 21:44.